Although the son of Sprint Car legend Sammy Swindell is sure to garner a lot of attention, Kevin Swindell has made sure that his name can stand on its own in the racing industry. Kevin’s jaw-dropping talent is supported by a list of prestigious accomplishments. 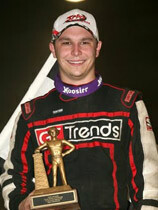 Accolades: Three time Chili Bowl Nationals Winner, 2009 Knoxville Nationals Winner, 2008 Western World Championships Winner, Youngest winner in World of Outlaws History.